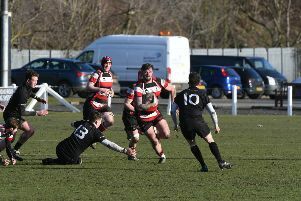 Hartlepool Rovers RFC (red/white/black) v Barnard Castle RFC (black) at The Friarage, Hartlepool, on Saturday. 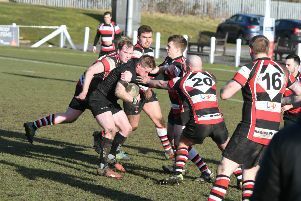 A superb defensive effort set up West’s hard-fought victory over fourth-placed Stockton at a blustery Brinkburn. The conditions made things tricky for both sides, but the home defence’s ability to limit the visitors to a single penalty was impressive, especially given the long periods Stockton spent in their 22. West did score three tries and were disappointed not to add the bonus-point try in the closing stages, but a win over the side sitting just below them in the table keeps the pressure on Durham City and Northern in the promotion race. With the strong wind at their backs in the first half, West were immediately deep in Stockton territory but soon found that kicking to touch from a penalty was far from a guaranteed advantage with the wind making any lineout throw difficult. After spurning a couple of opportunities from lineouts, they changed the approach and took a scrum from a penalty in the Stockton 22. The change in tactics proved immediately successful as, with another penalty advantage coming, player-coach Stu Waites slid through a gap in midfield and went over for a try under the posts. West’s second try came 10 minutes later and was created from static ball on half-way. Adam Brown managed to break through and give a nice offload to Adam Coates who in turn fed Will Hilditch to score. Stockton bounced back well and almost had a try in the right corner only for the defence to hold up the ball carrier over the line. The visitors were struggling in the scrum and the West forwards took full advantage, driving the Stockton pack off the ball and clearing the danger. Having already lost second row Jake Linighan to injury, West were forced into a further reshuffle when Hilditch took a big tackle and had to leave the field. With no backs on the bench, former wing Scott Butcher moved out wide with Chris Atkins coming on in the back row. Stockton continued to press and plug away at the defensive line, which somehow held out for a near-10 minute spell at the end of the half. The visitors were unlucky not to have a penalty try awarded, when a rolling maul was collapsed just short of the line. But despite losing Coates to the sin-bin, West held on manfully and gained a small victory when Stockton fly-half Steve Jones opted for a kick at goal in front of the posts with the last kick of the half. The scrum dominance West had shown in the first half continued in the second as a series of powerful scrums brought about the third score. The first drove the Stockton eight back over their own line for what should have been a simple touchdown for Atkins, but he spilt the ball as he tried to gather. Fortunately, he had the opportunity to make amends minutes later and this time, trapping the ball between his feet, jumped his way over the line. Despite playing into the wind, with half an hour still to go there seemed enough time to seal the fourth-try bonus point but West spent the majority of the remaining time in defence, again putting up a brick wall and refusing to allow Stockton further points.